While zebra jokes have pretty much taken over the Internet, it can be frustrating trying to keep up with all the different sites, from zeBRO.com to blackandwhitestripes.net to myspace.com/zebrahead. 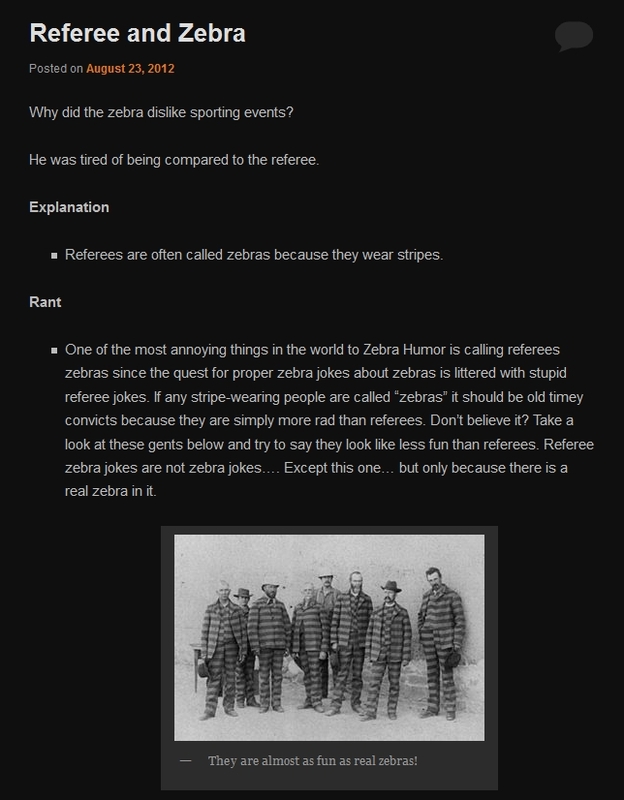 Fortunately, Zebra Humor not only compiles every zebra joke ever made (and some that have never been made, by anyone), it also earnestly explains the punchlines, and even rants about polarizing issues in the zebra-joke community when necessary. Zebra Humor also posts YouTube versions of its jokes, much to the amusement of sole commenter on every single clip AnnAnd. Well, actually AnnAnd could do without the pulsing 8-bit soundtracks, because zebra jokes, by nature, should be relaxing like a graze on the Serengeti plains. Also, she doesn't get some of the gags. But other than that. Oh, and I noticed "juggalo" was one of the site's tags, so I searched for it. 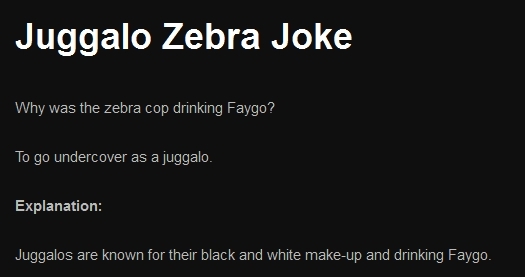 Here's the world's only juggalo/zebra joke!